A Lake of Isles Wedding combines modern amenities with classic elegance at one of Connecticut’s finest wedding and reception venues.The Lake of Isles Golf Club and Resort boasts contemporary cuisine, unparalleled guest service, and the scenic beauty of the Connecticut woods. The venue offers two spaces for couples to use on their perfect wedding day. The Pequot Village Ballroom holds up to 250 guests for the reception of any bride and groom’s dreams. The ballroom is surrounded by large, open windows that provide gorgeous views of the club’s lake. The room is adorned in warm earth tones, with dimmable chandeliers that add to an atmosphere of romance. The other space available is the breath-taking Lakefront Deck. This location is typically saved for wedding ceremonies, but is also used for small, al fresco cocktail receptions. The wedding ceremony pictured took place on the Lakefront Deck, with the natural beauty of the venue’s 900 acres of woodland providing a picturesque backdrop. Bridesmaids and groomsmen stand on the deck and watch as the bride and groom say, “I do”. The background is blurred, a watercolor mix of blue sky and tree branches. Sunlight shines down on the ceremony, illuminating the face of one of the bridesmaids. She is overcome with the emotion of the day and happy tears stream down her cheeks as she witnesses the bride and groom pledge to be forever faithful. The bridesmaids wore green sleeveless dresses and held bouquets of white and green. 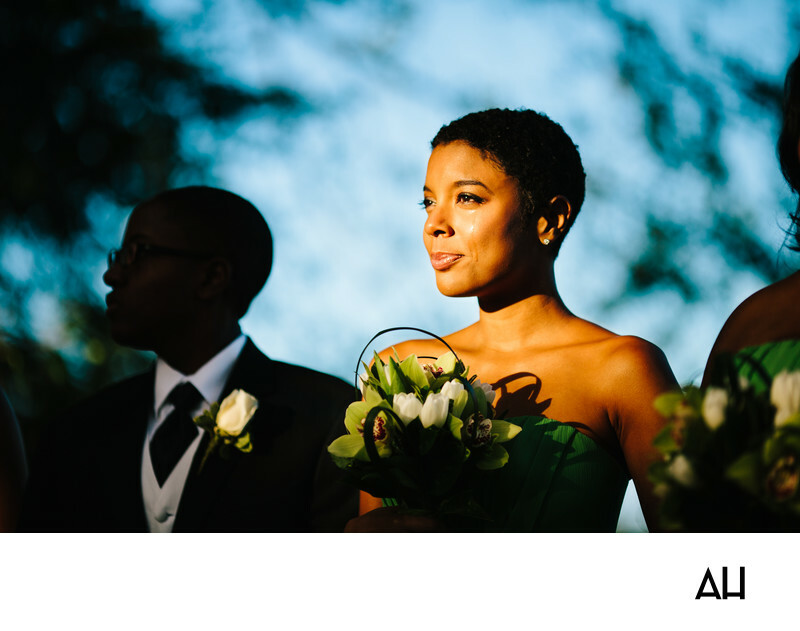 The colors of the wedding add to the vibe of natural beauty and elegance that flowed throughout a truly lovely day.